After you have created your website click Publish. You will then see your Sandvox publishing settings page. Enter your details (the settings you will need will be within your Welcome email from us). 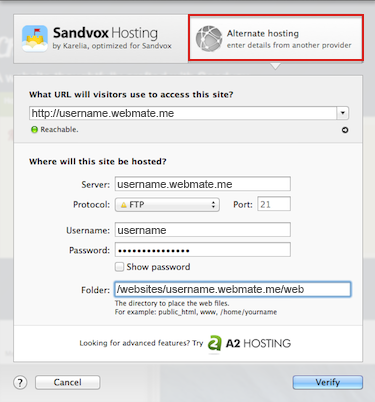 When complete, Click Continue and Sandvox will store your settings. Finally, Click Publish once more to upload your website to your WebMate. That’s it!